One of the most requested features for Google Maps Mobile was to add turn-by-turn navigation. In the past, this wasn't possible because of the licensing fees that had to be paid for each user of the navigation system. Now that Google no longer uses data from TeleAtlas in the US, turn-by-turn navigation can be added for free. 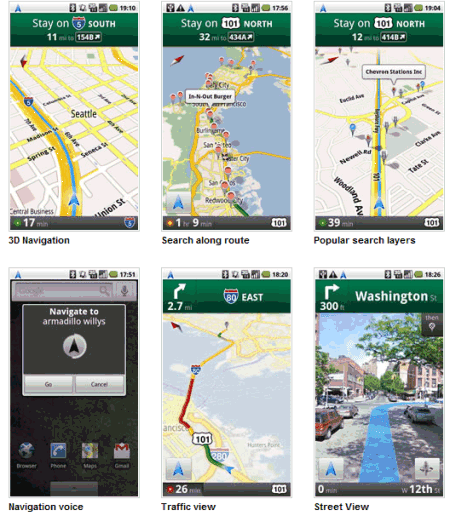 Google's blog announces that Google Maps Navigation will be available in Android 2.0. The first mobile phone that comes with Android 2.0 is Motorola Droid. "This new feature comes with everything you'd expect to find in a GPS navigation system, like 3D views, turn-by-turn voice guidance and automatic rerouting. But unlike most navigation systems, Google Maps Navigation was built from the ground up to take advantage of your phone's Internet connection." And unlike other navigation systems, it's free. For now, Google Maps Navigation is only available for the US, but it will certainly be available in other countries when Google collects enough mapping data. Companies that provide navigation solutions aren't afraid that they'll lose their customers. "There's a lot of content included in our applications that gets updated on an ongoing basis--and that costs money. Millions of customers use our service because of its reliability, ease of use and additional features. People are willing to pay a premium to have something work all the time on their phones," said a TeleNav spokesperson. So when will there be an iPhone version? SWEET! Definitely getting an Android phone now. The last thing they need to implement is a Tasks API, once they have that I'm good to go. I'd replace my Garmin Nuvi with this, if there was the option to preload the basic street maps onto the phone (I often drive in areas without (or with poor) cell phone reception). They may as well hang up an "Out of Business" sign on their door. The only, and I mean the only thing the other mappers have going for them is that they can only hope that Apple doesn't approve a forthcoming(?) app for the iPhone. When I looked at the prices for the TomTom and other apps, I just about had to laugh. Were they actually encouraging me to jailbreak my phone, and get similar functionality...For free? Milk it while you can, boys, because if it doesn't get ported over to the iPhone, I'll be scouring Cydia for the next best thing. Can this work without a data connection? If a connection is needed, stand-alone GPS is still needed. If Android can download the maps for a region and continue to work without a connection, stand-alone GPS is needed much less. Currently, I use both a Garmin nuvi and iphone in the car, I'm really unimpressed with navigation apps on the iphone. Apple, can you out do goggle on navigation? I'll admit, this is the only thing that I've seen from Android that would end my love affair with the iphone. Well done goggle! Would lime to see some data sharing between google's map data and OpenStreetMap though. that'd be awesome! Cool features but high risk of unhappy users due to mobile data availability and roaming issues. "Google is working with Apple on bringing it to the iPhone, and it's not ruling out licensing the software to makers of portable navigation devices used in cars throughout the world, said Gundotra, vice president of engineering at Google for mobile and developers. The process involving Apple is slightly different from the usual App Store submission process, because Maps is a built-in iPhone application, he said." They actually encouraging me to jailbreak my phone, and get similar functionality...For free? Milk it while you can, boys, because if it doesn't get ported over to the iPhone, I'll be scouring Cydia for the next best thing. Mobile Navigation on the Motorola Droid would be improved for use on a motorcycle if the turn-by-turn instructions could play to a bluetooth headset in the helmet. It is not possible to hear from the built-in speaker with road noise. I tried this and only the phone plays over the Bluetooth device.